(glyoxalate cycle) A cyclic series of reactions involving *TCA cycle intermediates in which one molecule of succinate is formed from two molecules of acetyl CoA. The reactions that differ from those of the TCA cycle are indicated by broken arrows in the diagram. These reactions are catalysed by isocitrate lyase and malate synthase respectively. 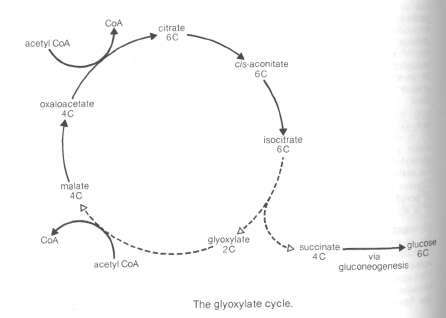 The glyoxylate cycle avoids the carbon dioxide forming steps of the TCA cycle and thus allows net synthesis of carbohydrates from fatty acids via succinate (see gluconeogenesis). The enzymes of the glyoxylate cycle are active in germinating oil-bearing seeds and in other fat-metabolizing plant tissues. The cycle also takes place in microorganisms but not in higher animals.